I really wanted to be a policeman, but without qualifications, this was impossible. A friend suggested hotel work, but my lack of English was a barrier. I had no money for English lessons! My friend told me about ZL4LF. I met Gasica and he agreed that I could learn free of charge! It was hard to be in a class with young children, but eventually I improved. I work with Chickens 4 Life. The Daraja Foundation sponsored me to attend a Permaculture Course. 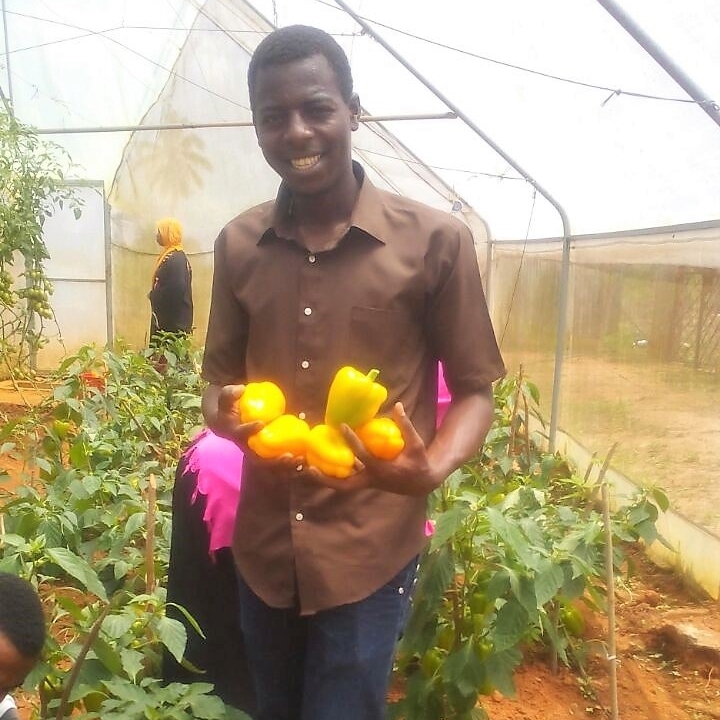 I learnt to grow organic food. I am excited to use the knowledge I gained on our organic farm. I love growing things and sharing my knowledge. 2016 has been fantastic! I became Business Manager of Chickens 4 Life and I started teaching English. For the future? I want to have my own farm and to continue to teach. My cousin encouraged me to come to ZL4LF as I needed to improve my English to succeed at school. The most amazing thing that happened to me was the opportunity to study for a year in Tampa, Florida. I was sponsored by Rotary Clubs in Zanzibar and St Petersburg, Florida. Now I am much more outgoing and I learned how to sing and improved my English. I've studied Air Travel ticketing and helped with running the Bicycles 4 Life Business. I am currently involved with the Girls 4 Life initiative. It's amazing to think that when I joined ZL4LF only four years ago I didn’t know any English. Through ZL4LF I had the opportunity to visit America with a Rotary Scholarship from Rotary Clubs in Zanzibar and Boston USA. On my return I trained in Air Travel ticketing for 6 months. I am now working at ZL4LF and recently enjoyed a short course on accountancy. Long term my dream is to become an accountant. When I joined ZL4LF my ambition was to improve my English and to do well at school. After only a year, I was delighted to be asked to teach at ZL4LF. Giving back to the community is important to me. I graduated from Sumaite University in Zanzibar in English and Kiswahili, which is a great background for my current work as an English teacher. I teach at the Safari English Club which is run by the Zanzibar Schools Project in the village of Unguja Ukuu. My long-term ambition is to study International Relations and teach at university level. With English everything is possible! Working as a teacher at ZL4LF gave me opportunities to make wonderful changes in my life, turning me from nothing into something. I'm studying Procurement and Logistics Management at Zanzibar University. I teach English to fund my studies. I'm proud of what I've achieved and know that everything is possible with ZL4LF. I want everyone to come and be part of us! I’m a waiter thanks to ZL4LF. I had failed my exams and I was traveling miles every day to sell water to support my family. Then I met Gasica who advised me to train in hotel management. Now I am qualified to work as a waiter or as a receptionist. With my first paycheck I got my family's toilet repaired. I bought them furniture and I want to connect their house to electricity. My brother was killed in a bus crash and my sister also passed away. Their daughters rely on me to keep them in school. On the long term, I hope to become a hotel manager. I joined ZL4LF to learn English hoping it would open the door to many opportunities. My family is poor and couldn’t afford fees for me to study English privately. ZL4LF gave me a free education and a home as my family live a long way away. I worked hard and joined the Bicycles 4 Life workshop. I learnt everything I could but my real ambition was to be a receptionist. Global Bridges helped me find a course and I hope to qualify to work in a hotel and look forward to welcoming tourists to Zanzibar! I'm passionate about bicycles! Although I’m only 17, I've learnt enough to become the business manager of Bicycles 4 Life. My training in bicycle maintenance, business management, computers and English at ZL4LF prepared me for my job at Bicycles 4 Life. Long-term? I want to succeed in business. The experience of running Bicycles 4 Life is a great foundation for realizing this dream. When I came to ZL4LF in 2012, I did not know any English. I had finished school but not passed any exams. I was inspired to join ZL4LF by my friend as I wasn’t doing anything else. I learned English and computer skills. I decided to study Human Resources as I want to work in Public Service. I love my studies and I’m so grateful that Goza and ZL4LF gave me a scholarship. When I’m working, I want to give back to the community here. It seems as if I’ve always known about ZL4LF as I live round the corner! It’s actually 6 years that I’ve been studying English here – I’ve also worked at Bicycles 4 Life and Chickens 4 Life. But I always wanted to be a driver – I love cars and I watch TV programs about cars in my spare time. Last year I passed the exams to drive a public vehicle. When I’m not driving the ZL4LF students, I use the same bus to take passengers between Stone Town and Zanzibar University. It’s a long day – I start at 6am and finish at 6 pm but I love my job and I don’t think I’d have it without the encouragement from my ZL4LF family.